Woohoo, it's Saturday!!! Good Morning!!!!! I hope you're all off to a great day! I'm doing laundry and we have left overs for a change!!! Things are looking up LOL!! My card for today is for the Limited Supplies Challenge on SCS. We had to CAS---make Clean and Simple cards.....do you have any idea how hard it is to not add layers?!!! I must admit though that it was nice to sit down and make a card in 5 minutes and still be able to say---"How pretty" I used Inspired by Nature for my grass stamped in Old Olive, the butterfly out of Essence of Love stamped in Regal Rose & punched with different circle punches and a sentiment from Best Yet punched with the Wide Oval Punch. I added some Regal Rose grosgrain ribbon and I was all done!!! Well I'm off to the laundry room.....it's never ending with 3 children and a husband with constant dirty clothes due to his job! I hope to complete a few challenge cards in between loads---that would be sweet!!! Thanks so much for stopping by & I hope you have a great rest of the day! I feel your pain with the layers...I did CAS too...although I like yours better! Love the colors! It's hard doing a CAS when you're used to layering and embellishing to your hearts content! LOL. Anyway, lovely job! Wow, you get your day started early!! This is a beautiful CAS card. Like the layers for the butterfly! Man! I hate laundry! Hubby usually does it. Yes. He's VERY WELL trained! But I do the folding. He always says "It's so much more fun when we do it together. Plus, it gets done faster." So true. Beautiful card. I like the CAS look. Looks like it's gonna warm up some. Lucky us!!! Jackie, this is GORGEOUS! I tried to use the grass but couldn't figure out what to do after I stamped it...lol! LOVE what you did! This would make a GREAT workshop card too!!! TFS! Beautiful Card Jackie! I love it! This is a wonderful challenge and you did a fabulous job as always! HA!! I do NOT do clean & simple, lol. Love the look, but I can't do it right. This is beautiful....and what a great card if you need to mass produce!! Sounds like you are having a wonderful Saturday...except for the laundry part (are we ever NOT doing laundry?) but yay for leftovers! WOW, Jackie, your CAS is gorgeous! This is perfect in everyway! This is beautiful, love your colour combination too. Just beautiful Jackie! Great colors. (LOL - I looked at the same challenge and said I'll NEVER be able to do that and gave up.) I think I need this set now! simple yet elegant, LOVE it! what I dont LOVE is the laundry, which I am off to do before it gets too hot..4 kids and a one child and one hubby who get FILTHY...uuurrgghh!!! Super cute Jackie! I love your CAS card, it is so hard for to make a no layer card! TFS and thanks for dropping by my blog earlier! I love this set, hated to see it on the dormant list. Very nice! 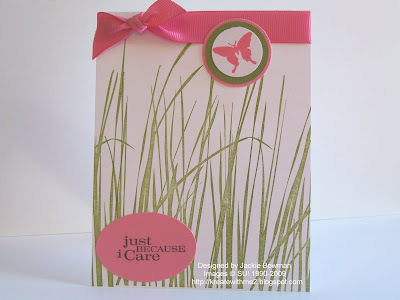 Sooo pretty, Jackie....love how you used the grass stamp and the butterfly layers and ribbon add such elegance!!! You did a fabulous job on this!!! This really is so beautiful. I love the peaceful meadow feel. I made a CAS card too and it WAS hard not adding tons of layers like I always do. Absolutely beautiful!! I love the olive and the pink and the clean simplicity of this design. Very pretty. It feels so springy and warm! Such a pretty design. It is nice to make simple cards sometimes. TYFS! OMG - that is the most beautiful card I've seen in ages.....I love your blog - -but that card is just amazing!! Beautiful card, and the colors are great! Great color combo! I love it! I think "Spring" when I see this!! TFS!